What was the inspiration behind Priscilla The Great? 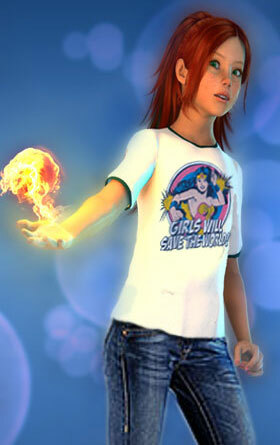 I wanted to create a character with a strong voice and the ability to take on the world. I wanted to show that girls don’t always have to be the one to be saved or wait for the boys to have all the adventures. From the start, Priscilla was always a take charge kind of girl, but the wonderful thing about her is that she is still a girl. She may prefer a Marvel comic book over the latest issue of Glamour magazine but she still has a feminine side. She’s fun, she sassy, and she’s adorable. She’s just one hot little girl. I loved Priscilla! She has such a great voice! How did you come up with her character? I was a high school math teacher for 9 years and Priscilla is a combination of two of my students. Her personality is based on a quirky fourteen year old girl named Helen who would come to class every day and tell me about some weird thing that could only happen to her. Priscilla looks like another student of mine named Ellen. You can actually see her in the book trailer I made. Do you have a favourite scene from the book that you can share with us? I think my favorite scene has to do with Priscilla’s twin little brothers Charlie and Chester. They are hilarious little trouble makers. When they help Priss catch Stefanie in a lie it’s laugh out loud funny. I really don’t know how in the world I came up with that chapter! I actually have a collection of short stories all about the devil twins called Twins Shorts. You can buy it for 99 cents (74 pence) at Amazon. A close second is when Priscilla tricks Kyle into buying her feminine products. It still makes me smile when I read it. I'm really looking forward to the next book. Can you tell us more about it? In the next book, the Sumner family is in hiding. We learn more about the Selliwood institute and what Colonel Selliwood has planned as they try to defeat him through several clandestine missions. We get to know more about Marco and Katya who were introduced at the end of book 1. Also, Josh’s vision of what Tai does to Priscilla comes true. The funniest scene in book 2, in my opinion, involves Priss’ father and the lingerie department at Walmart. Don’t miss it! How many books do you plan for the series? There are five books total right now. I also have ideas for a three book series for Tai, a five book series for the twins and a two book series for Josh. Those are only ideas right now. Nothing has been written for those yet. My favorite aspect is bringing to life all these ideas and characters in my head. I could literally hear Priscilla having conversations in my mind and she just wouldn’t shut up until I started writing. The most challenging I think is promotion. It’s hard getting the word out about my book. I’m basically doing it all alone which is even more difficult because I’m currently working on a PhD in Biostatistics and trying to take care of my husband and two kids. 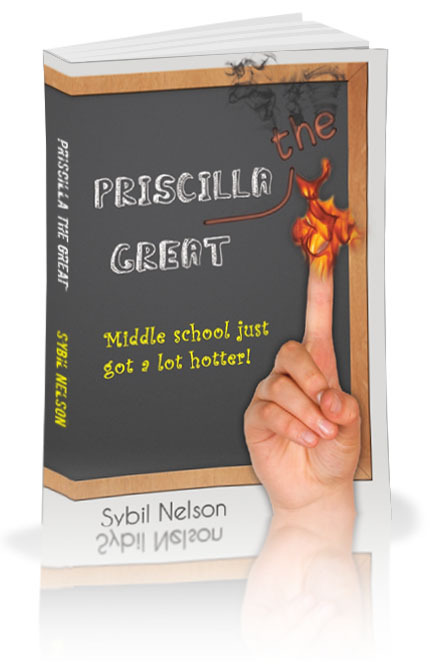 I’m hoping that word about Priscilla the Great will spread and that it will catch on. My agent sold the movie rights to the series last year and they just modified it to a TV show option instead. I’m hoping that the TV show will get picked up and that Priscilla will become as popular as she deserves to be. I think my love of writing emerged from my love of books. I was absolutely addicted to books as a child. I loved falling into a story and surrounding myself in the characters. I wanted to create worlds like that as well. There are so many untold stories out there and I wanted to tell them. Unfortunately, when I went to university, I got discouraged in my writing. I ended up switching from an English and Journalism major to a math and music major. I got back into writing when I became a teacher. My students inspired me. Typically, I wake up around 7 and make breakfast for my family. My little girls and I like to have a dance party in the kitchen while I cook. Then I try to do something educational with my five and three year olds, maybe work some math problems or read a book. Then I leave my kids with my husband as I go off to school. I’m in class for three or four hours occasionally taking out my writing notebook and jotting down ideas for my next book in between solving math problems. After class I usually tutor a high school student in math. On most days when I get home it’s my husband’s turn to go to work. On other days, he is off and we get to spend the evening together. In either case, after I check email and try to do some book promotion stuff online, it’s time to make dinner which calls for another dance party with the girls. (yeah, there’s a lot of dancing in my house.) After the kids go to bed, I put in a couple of hours doing math work and then it’s time to work on my writing. My ‘must have’ for writing is a glass of red wine and some dark chocolate M&M’s. They really hit the spot. I also have soundtracks for each book I write that get me in the mood for that book. I usually write until I’ve listened to the specific playlist in its entirety. At about midnight, it’s time for more online book promotion which usually involves seeking out fabulous bloggers like yourself! When I tire of that, I take out a book and read until I can’t hold my eyes open anymore. I have a very varied taste in literature. Every phase in my life is marked by a different genre of books. I went through a Sweet Valley High and Babysitters Club phase when I was little, then I went through a VC Andrews and Harlequin teen romance phase, and then I was completely addicted to English literature and read the complete works of Jane Austen and Shakespeare one summer. My favorite book in high school was Tess of the D’urbervilles by Thomas Hardy. A really good book for younger readers is A Wrinkle in Time by Madeleine L’Engle. I actually taught at the high school she attended in South Carolina USA. I guess I really must have loved that book! I love Michael Crichton, Tom Wolfe, Jaqueline Woodson, and I absolutely adore Phillippa Gregory. I thought The Constant Princess was amazing and romantic. And I couldn’t stop reading The Other Boleyn Girl. Right now I’m going through a YA phase, probably because that’s the genre I write. I’m reading the Gallagher Girl series by Ally Carter, I enjoyed Matched by Ally Condie, I loved Percy Jackson and the Olympians by Rick Riordan. “Priscilla” actually wrote a blog about why she must marry Percy Jackson. Oh, I also love Meg Cabot. I thought Avalon High was so clever. And I like her Heather Wells series. If I could be as prolific as Meg Cabot, it would be a dream come true. Okay, I better stop now. As you can see, I read a lot. I could keep going for pages about my favorite books. Thanks Sybil! I LOVE the scene where Kyle is tricked into buying that stuff! And Priscilla's brothers are ace! If you haven't read it yet you can check out Priscilla's guest post here where she tells us her ten top reasons why she should marry Percy Jackson! Brilliant post! I sooo want to read Priscilla the Great: it's right at the top of my wanted list! I really loved hearing more about the thoughts that went into the story.